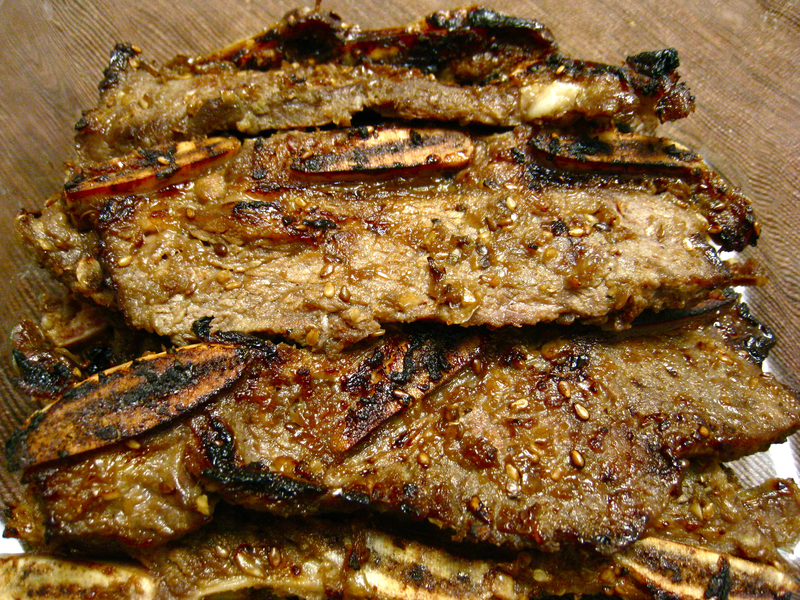 Galbi (Korean Grilled Beef Short Ribs) | ohcrumb! Score. I found a great deal on short ribs at H-Mart, and excitedly scooped up a pack. Actually, I scooped up TWO packs, but a little voice in my head told me not to be greedy, so I summoned all the willpower I had and put one back. As nicely as the cast iron pan + broiler worked, I would LOVE grilling this for real some day, for that awesome barbecued flavor. 1. Rinse the short ribs to get rid of lingering bone dust. 2. Combine the short ribs and seltzer in a large bowl. Sit for a few hours. This does two things: 1) The acid from the carbonation helps tenderize the meat; and 2) the cold soda helps drain the blood from the meat. 3. Discard the soda, and do a quick rinse of the meat. Set aside. 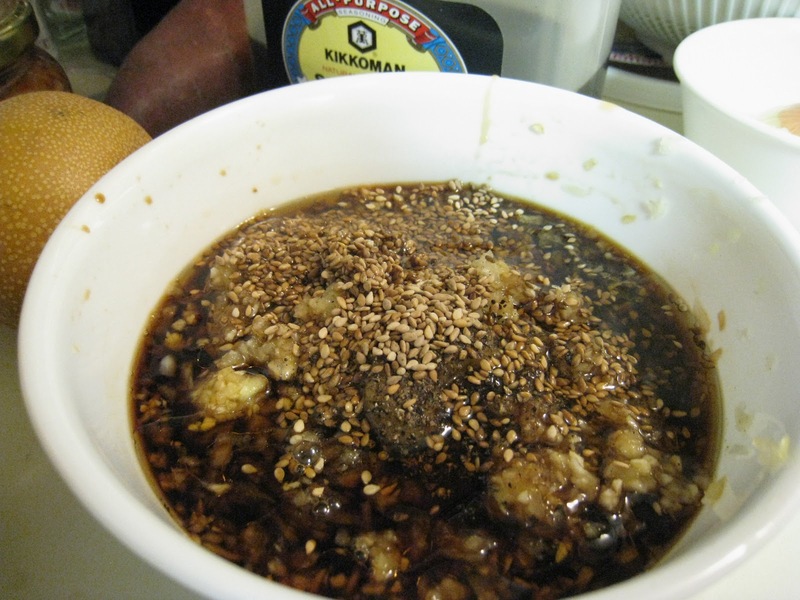 In a bowl, combine the marinade ingredients and mix thoroughly. 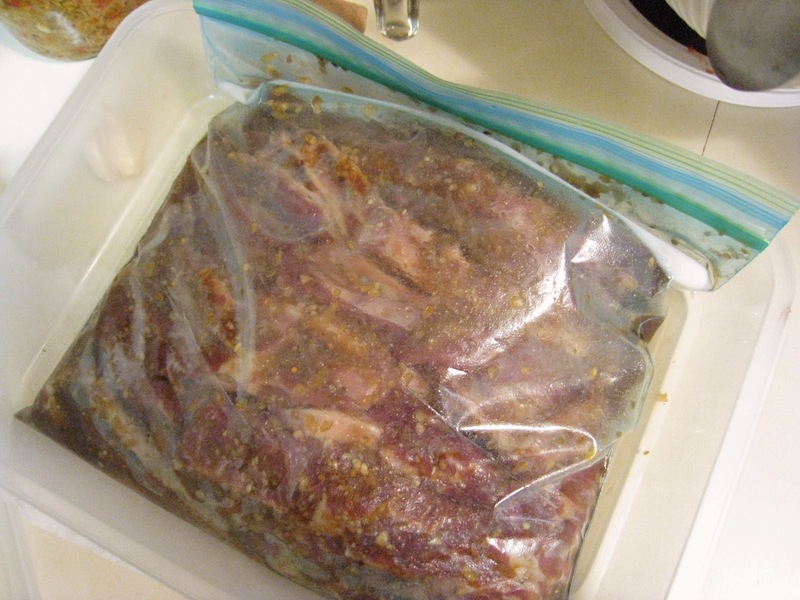 Place the meat and the marinade in a large ziploc bag, flipping several times to ensure the meat is fully coated. Marinate over night. 1. Place meat in a cast iron pan. 2. Place pan on a rack positioned near the broiler at the top of the oven. 3. Broil for several minutes until meat is browned/sizzling. I like it barely charred on the outside, and still a little pink inside (I would have liked positioning the oven rack one level higher, to get slightly more charring, and caramelization of the fruit/sugar without cooking the inside more, but my mom was convinced I would set the house on fire). Oof, look at that lustrous layer of fat. Looks wonderful! I recently found flanken cut beef ribs the other week for the first time. Wanted to do a recipe similar to yours, but couldn’t get Asian pears, so just sorta winged it. Grilled up in no time and everybody loved it. I’ll have to keep my eyes open for those pears and try your version. Thanks for sharing it. Thanks, Griffinsgrub! Awesome! What did you end up doing? I feel like much of Asian cuisine is like that – winging it, no measurements and even switching up ingredients as one sees fit. I’ve actually heard of people using kiwi in place of the asian pear. Since the role of the fruit is to not only sweeten the marinade, but also to tenderize the meat, perhaps using any type of acid-containing fruit would work. If you try it out, let me know how it goes!